Help children develop language and verbal functions! Responding to the overwhelming demand for effective language development tools for children with no language and severe language delays related to autism and other disabilities, Douglas Greer and Denise Ross present newly identified methods to assist teachers and parents in their efforts to provide verbal capabilities to children. 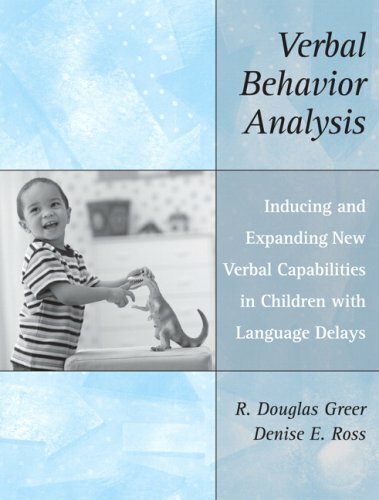 In their book Verbal Behavior Analysis, Doug and Denise describe how to help children produce novel and spontaneous verbal functions, acquire language incidentally, and become socially verbal. They carefully integrate the latest research, including many new findings, and present readers with a clear outline of the current state of the science of verbal behavior and its application to children with real needs. Behavior analysts, parents, and teachers will find the procedures applicable to all forms of language (signs, pictures, and voice-generating devices) while maintaining a strong emphasis on the vocal production of a child’s speech. Describes how to teach children to be literate listeners, reducing the number of instructional times required to teach basic skills from four to ten times. (Chapter 3). Presents the necessary procedures to teach children to become observational learners. (Chapter 5 and 7). Offers practitioners methods for teaching children to acquire novel language and language usage incidentally, allowing children to expand their language without direct instruction. (Chapters 3, 5, and 6). Demonstrates helping children to move from emergent speakers to readers, and learn to enjoy books in free time, and to read. (Chapter 6). Introduces a verbal developmental scheme to guide instruction and aid practitioners in determining which children need particular interventions and when they need them, along with alternative tactics and strategies for solving learning problems. (Chapters 2 and 7).